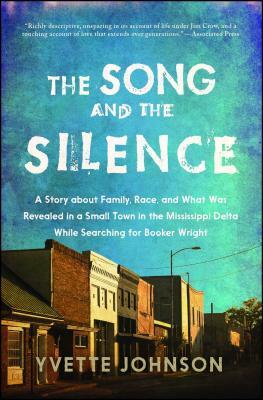 The Song and the Silence: A Story about Family, Race, and What Was Revealed in a Small Town in the Mississippi Delta While Searching for Booker (Paperback) | Turnrow Book Co. In this "beautiful, evocative" (Booklist, starred review) memoir, Yvette Johnson travels to the Mississippi Delta to uncover the moving, true story of her late grandfather Booker Wright, whose extraordinary act of courage would change his and, later, her life forever. "Have to keep that smile," Booker Wright said in the 1966 NBC documentary Mississippi: A Self-Portrait. At the time, Wright was a waiter in a "whites only" restaurant and a local business owner who would become an unwitting icon of the Civil Rights Movement. For he did the unthinkable: speaking in front of a national audience, he described what daily life was truly like for black people of Greenwood, Mississippi. Four decades later, Yvette Johnson, Wright's granddaughter, found footage of the controversial documentary. No one in her family knew of his television appearance. Even more curious for Johnson was that for most of her life she'd barely heard mention of her grandfather's name. Born a year after Wright's death and raised in a wealthy San Diego neighborhood, Johnson admits she never had to confront race in the way Southern blacks did in the 1960s. Compelled to learn more about her roots, she travels back to Greenwood, Mississippi, a beautiful Delta town steeped in secrets and a scarred past, to interview family members about the real Booker Wright. As she uncovers her grandfather's compelling and ultimately tragic story, she also confronts her own conflicted feelings surrounding race, family, and forgiveness. "With profound insight and unwavering compassion, Johnson weaves an unforgettable story" (Publishers Weekly, starred review) about her journey in pursuit of her family's past--and ultimately finding a hopeful vision of the future for us all.